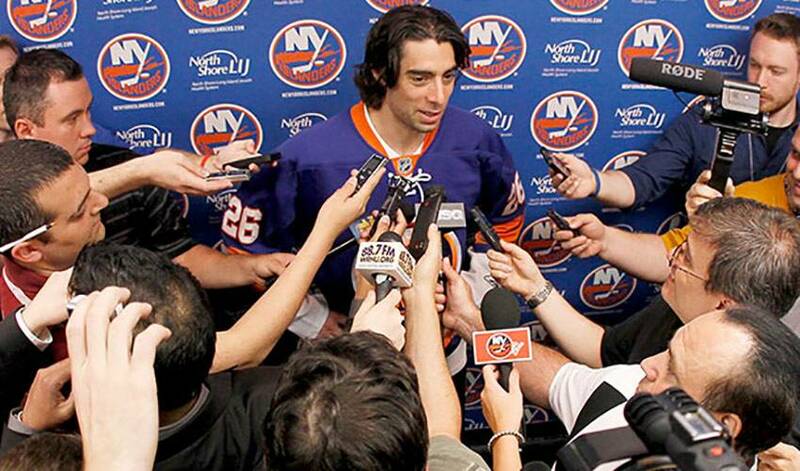 It was obvious Matt Moulson was a tired man on Wednesday morning. It was equally evident he was elated to have reached a career milestone. Less than 12 hours after the New York Islanders secured their first playoff berth since 2007, Moulson, who once again played a leading offensive role on the Atlantic Division squad, was still wrapping his head around the thought of making his first NHL post-season appearance. It’s been an up and down year for the Isles, who got off to a miserable start, but have played their best hockey over the last six weeks. Moulson, understandably, is focused on the club’s recent form. That would also be applicable to the game that put the Isles in the Eastern Conference playoff picture. Exuberance over their accomplishment quickly gave way to further expectation. Still, the victory remains a sweet one for the 263rd overall draft selection of the Pittsburgh Penguins in 2003. Not all in the hockey world figured the Islanders would be in the Eastern Conference’s top eight this season. And hungry for more success.